Mix together chili powder, cumin, garlic powder, cayenne pepper, salt, and ground black pepper in a small bowl. Heat a large skillet over medium-high heat and cook ground beef, stirring often, until the meat is crumbly, evenly browned, and no longer pink, about 10 minutes. Mix in onion and garlic; cook and stir until the onion has softened and turned translucent, about 5 minutes. Stir spice mixture into ground beef mixture and cook until fragrant, 2 to 3 more minutes. Combine salsa, sour cream, and lime juice in a small bowl. 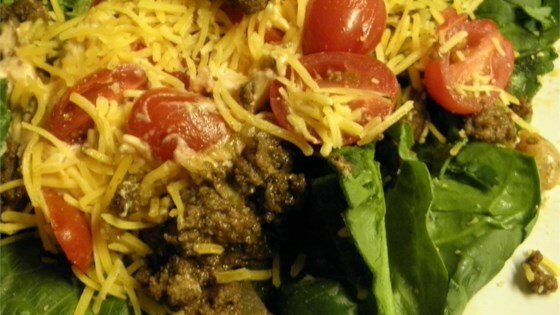 To serve, spread shredded romaine lettuce onto a serving platter and top with meat mixture, salsa mixture, cherry tomatoes, Cheddar cheese, and chopped cilantro. Not exactly Paleo because of the dairy (sour cream and cheese), but you can omit those. Otherwise a good dish. The dressing it was a bit weird and I'm not sure I would make it again this way. The flavoring tasted mostly like chili powder to me but my SO liked it. The spices in this recipe were excellent, full of flavor with out being overly hot. The sour cream and salsa mixed together makes a tasty layer in this salad. Just used the spice combo for my own taco seasoning. Great proportions ......no need to buy taco seasoning anymore! Not paleo, but can be considered "primal" because of the dairy. I added 1cup of water and simmered for 20 mins, to let the flavouring set into the meat and not be so gritty. I would make again.